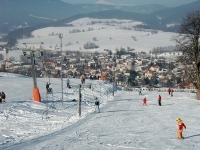 Ski lift (POMA type) and ski slope in Dolní Albeřice near Horní Maršov is suitable for ski beginners and also advanced skiers. The advantage is above all the width of ski tracks and fair altitude of 700-760 metres ensuring good snow conditions. Calm and relaxing skiing without standing in queues on 550m long ski lift with maintained ski slope. The location is suitable both for beginners and advanced skiers. Night skiing under good weather conditions. SkiResort ČERNÁ HORA – PEC is the biggest skiresort in the Czech Republic offering 41km of ski slopes and tracks with one ski pass. This resort is formed of 5 connected ski areas, each of them having different character and various difficulty level and length. Besides long slopes and tracks a special track Funline with banked turns and an 8 m long tunnel and localities for child skier can be enjoyed. All year-long opened area offers the visitors, mainly the smaller ones, huge portion of fun, adrenaline and sports. Thanks to the width and profile of its tracks, the ski resort offers activities both for families and for skiers who prefer quieter slopes and lifts without queues. 7 lifts and a 3-seated chair lift running at 5.1 km daily-maintained and snowy tracks. 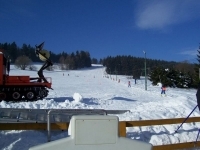 Ski area is situated in 1000 m above the sea level so it is the only Czech ski slope which is rated among the alpine resorts. High altitude and an artificial snowmaking system with the help of snow cannons assure the quality of snow within the whole season (3.7km of slopes, 7 lifts).